Fully customizable Exchange and Outlook PST backup tool. A fully customizable Exchange OST and Microsoft Outlook PST files backup tool for corporate environment. Backup Outlook PST and Exchange OST files to your enterprise workstations' local drive or Network located backup storage automatically. The latest Microsoft Outlook 2019 saves data of most types of accounts to OST files (only POP3 accounts use PST files) - if you are a user of Outlook 2019, Safe PST Backup Enterprise is the right tool for you to backup OST files. Safe PST Backup uses incremental backup model to back up and transfer changes made to Outlook items only. Backup will be done in the background regardless of whether Outlook is running or not. Convert OST file to PST file automatically during backup. Create scripts to customize Outlook backup using command line parameters. Safe PST Backup will locate and back up all PST files on user's workstation. Select specific PST files to back up only. Hide Safe PST Backup interface from the selected end users completely. Contact us and 4Team will create custom Microsoft Outlook and Exchange backup solution designed for your company needs. Back up Outlook as soon as any changes are made. Support Windows domain rules and group policies. Back up personal Windows folders and data along with Outlook items. AES 256 bit security to protect your Outlook backup from unauthorized access. Reliable PST and OST files backup software for any Enterprise. Backup Outlook PST and OST files on every workstation in your corporate network. The backup will be done in the background regardless of whether Outlook is running or not. Most of our competitors’ backup software is backing up Outlook by simply copying PST files or making their shadow copies. PST files are backed up without the latest changes because Outlook is locking up PST file and shadow copies include information that has been saved after the latest close of Outlook only. Safe PST Backup uses sophisticated technology to access Outlook items directly and backs up the latest changes even if Outlook is open and you are working on it. The trusted software to backup OST files for users of Microsoft Outlook 2019. Backup Outlook 2019 OST files to a local drive as a PST file. The latest Outlook 2019 brought some changes to the table and now most types of email accounts use OST files to save such Microsoft Outlook data as emails, contacts, calendars, tasks, etc. (only POP3 accounts are still using PST files). This means that if for any reason you lose access to these accounts, in many cases you won’t be able to access data in that OST file any more. The Safe PST Backup Enterprise allows you to backup OST files. Keep your data safe in a PST file saved on your hard drive or cloud. 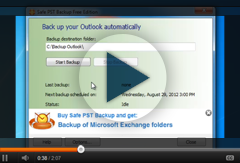 Safe PST Backup backs up your Microsoft Outlook no matter if it is open or closed. Admin tool for Safe PST Backup allows you to keep track of .pst files backup process on the corporate network. The monitoring tool shows the Safe PST Backup status of group of computers in real time and notifies if any backup issues occur. Click here to read more about the Safe PST Backup Admin tool. Compatible with existing corporate software provisioning and Network PCs central management systems for new software installation and updates. Change Outlook backup settings from administrator’s computer easily. Create several configurations for different sets of network PCs. Create and edit one configuration file to set up Outlook backups on several network computers. Customize backup the way you want using scripts and command line parameters. Save backup logs to a specified location or receive them to your Inbox as soon as some errors occur. Configure Safe PST Backup so that only the administrator could change the program settings. Ability to create multiple backup profiles with different settings. Using profiling option you can set up separate scheduling, location and other settings for multiple storage files. This way you can customize and improve your backup files management. Profiles can be managed using an additional profile management dialog which can be enabled via configuration file. Fast incremental Microsoft Outlook backup. Safe PST Backup will back up only changes made to your Outlook items to reduce backup size, transfer time and network traffic load. Keep multiple restore points by enabling history backups. History backups can be scheduled to ensure multiple full backup restore points. A full backup is done at the scheduled date and time and previous backup files will be kept as well. Full history backups are scheduled separately from regular backups to offer easy and flexible ways to customize your backup preferences. Backup retention options for history backups. When scheduling history backups, the number of previous backup copies that will be kept can be specified to make sure that multiple restore points are saved without using excessive disk space. Additional disk space limitations can also be selected to optimize Outlook backups according to your needs. Auto-detection of connection type and speed. Custom settings for each type. In case network location is selected as backup destination, Safe PST Backup can test the connection before starting backup process. Using the Safe PST Backup specific settings can be set for different type of connection. The testing is turned on for Wi-Fi connection by default. Choose desirable actions for each scenario: skip or continue backup in case of slow connection, prompt end-user or not. Specify IP range to perform backup and define other parameters using the configuration file. Easily integrated with existing backup solutions to prevent data loss. Safe PST Backup will back up all the latest changes (including deletions). Integrate with standard Enterprise backup solutions for history retention and to preserve Outlook PST files backed up earlier. Customizable Microsoft Outlook OST and PST backup solution. Safe PST Backup will locate and back up all PST and OST files on a user’s workstation. Select specific OST or PST files to back up only. Specify Outlook folders to exclude from backup. Back up Outlook items modified starting from specified date only. Exclude private items or Custom forms. Hide Safe PST Backup interface from selected end users completely. Simple Microsoft Outlook Data Disaster Recovery. Simple recovery of the entire OST or PST file using existing corporate file backup/restore solutions and end user “self-service” recovery of selected data using Microsoft Outlook import file feature. No need to provide sophisticated instructions or train your staff. Using Safe PST Backup will prevent from excessive backup storage and use of costly server solutions. Convert OST to PST file automatically. Convert OST to PST files automatically during backup. Safe PST Backup is a simple OST to PST converter software for Microsoft Exchange folders. OST is Offline Storage Table files of Microsoft Outlook. Store PST files from different Exchange sources in one backup file. Incremental backup via Windows Volume Shadow copy service. Windows Volume Shadow Copy Service (VSS) is now supported by Safe PST Backup. This gives the additional level of the backup security for your PST files. It also highly increases the speed of the first backup. Read more about VSS by clicking here. Experienced Customer Support. Cost-effective solution for any use. Every customer will be provided with technical support service via Live Help and e-mail. We have an experienced team of professionals who have worked for over 10 years on providing solutions for Microsoft Outlook and Exchange. Please contact us for custom support options. You will have the best price and service from an industry veteran starting from our Safe PST Backup Free for personal use to Enterprise edition of custom backup solutions for small or large businesses. Custom Outlook and Exchange backup solution for your company. 4Team will develop Outlook and backup Exchange tool designed specifically for your needs. Back up Outlook files as soon as changes occur. Windows domain rules and group policy support. Back up personal data along with Outlook items. *This feature is not yet available for trial in the standard package. Contact us to order or try Admin Tool as part of custom solution.